Semtech Corporation (Nasdaq: SMTC), a leading supplier of high performance analog and mixed-signal semiconductors and advanced algorithms, announced the availability of a new load switch in its FemtoSwitch™ product family. The new ultra-low-Ron (32mΩ) load-switch is critical in improving power performance by maintaining a negligible voltage drop when the switch is turned on. 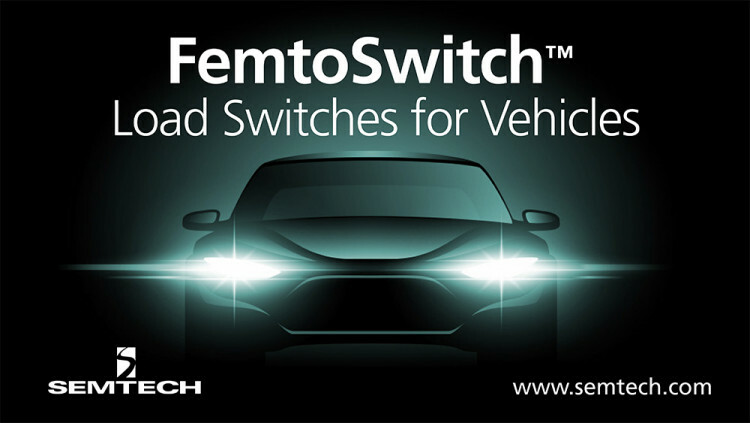 The new addition extends Semtech’s FemtoSwitch family of high-performance analog load switch ICs with the automotive qualified capability. It offers a very low Quiescent Current (1uA) and Shutdown Current (300nA), ideal for preserving the battery life of certain products such as automotive smart-keys. For higher reliability, the electrostatic discharge (ESD) capability has been hardened to 4kV which is beyond the industry standard. The ultra-low Ron load switch (SKU: SC33020HQ) are available immediately in production quantities and are priced at $0.61 each in 1,000-piece lots. Semtech offers comprehensive design assistance, including field- and factory-based support. Datasheets, volume pricing, and delivery quotes, as well as evaluation kits and samples, are available at http://www.semtech.com/apps/form_request/. Semtech offers high-performance analog load switches with industry-leading performance to control power to downstream systems. The extremely low RDS(on) of Semtech’s FemtoSwitch products translates to minimal power loss for any gated power supply rail. The FemtoSwitch platform is designed for superior reliability and ruggedness to ensure long operating life through the harshest environments and operating conditions possible. • Subscribe to Semtech’s e-newsletter Inside Circuit for quarterly product updates. Semtech Corporation is a leading supplier of high performance [analog, mixed-signal semiconductors and algorithms][analog and mixed-signal semiconductors and advanced algorithms] for high-end consumer, enterprise computing, communications, and industrial equipment. Products are designed to benefit the engineering community as well as the global community. The Company is dedicated to reducing the impact it, and its products, have on the environment. Internal green programs seek to reduce waste through material and manufacturing control, use of green technology and designing for resource reduction. Publicly traded since 1967, Semtech is listed on the Nasdaq Global Select Market under the symbol SMTC. For more information, visit www.semtech.com. All statements contained herein that are not statements of historical fact, including statements that use the words “positioned to,” “designed for,” “designed to,” or other similar words or expressions, that describe Semtech Corporation’s or its management’s future plans, objectives or goals are “forward-looking statements” and are made pursuant to the Safe-Harbor provisions of the Private Securities Litigation Reform Act of 1995, as amended. Such forward-looking statements involve known and unknown risks, uncertainties and other factors that could cause the actual results of Semtech Corporation to be materially different from the historical results and/or from any future results or outcomes expressed or implied by such forward-looking statements. Such factors are further addressed in Semtech Corporation’s annual and quarterly reports, and in other documents or reports, filed with the Securities and Exchange Commission (www.sec.gov) including, without limitation, information under the captions “Management’s Discussion and Analysis of Financial Condition and Results of Operations” and “Risk Factors.” Semtech Corporation assumes no obligation to update any forward-looking statements in order to reflect events or circumstances that may arise after the date of this release, except as required by law. Semtech and the Semtech logo are registered trademarks or service marks, and FemtoSwitch is a trademark or service mark, of Semtech Corporation or its affiliates.